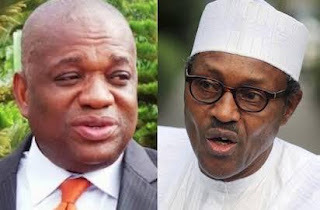 Home Politics Orji Uzor-Kalu Congratulates Buhari, Says The Victory Of The President Is Well-Deserving. Orji Uzor-Kalu Congratulates Buhari, Says The Victory Of The President Is Well-Deserving. Former Governor of Abia State and Senator-elect of Abia North Senatorial District on the platform of the All Progressives Congress, APC, Dr. Orji Kalu has congratulated the President, Muhammadu Buhari on his re-election in the last Saturday presidential and national assembly elections. Orji Kalu said that the achievements of the current government under President Buhari are unbeatable and remarkable, acknowledging the goodwill of the President, the former governor called on politicians to emulate the worthy qualities of President Buhari. In a goodwill message signed by the Senator-elect on Wednesday, he called on other Nigerian leaders to join hands with President Buhari in rebuilding the country, adding that the future of Nigeria is brighter under the current administration. Furthermore, he said, "the well-deserved victory of President Muhammadu Buhari did not come to some Nigerians as a surprise because of the laudable achievements of the federal government, as the "President Buhari has in past four years taken Nigeria to enviable heights”. While commending the Independent National Electoral Commission (INEC), security agencies, local and international observers, civil society organisations and other stakeholders for ensuring a free and fair election, Kalu urged Nigerians to sustain their support for President Buhari and his party, the All Progressives Congress (APC).